The water’s depth and temperature will determine a character’s survivability when they are under the water. The deeper a character ventures down into the water, the greater the water pressure. Freedom of movement and water breathing will not protect characters from either the crushing effects of deep water or the effects of cold. The indicated Constitution saves must be made one round after being at a certain depth. If the save is failed, then the damage is taken and another save must be made each minute until the character makes a Constitution save, after which further saves are not necessary. The character is then considered acclimated to that depth. Descending to a deeper depth range as indicated on the table, however, requires another saving throw be made. Water conducts heat much more efficiently than air; therefore cold water causes much greater loss of body temperature than does cold air. It is also important for DMs to note that water becomes heavier as it cools until it reaches a temperature of about 37 degrees Fahrenheit (just above freezing). Below 37 degrees, as water crystallizes into ice, it becomes lighter so that ice will float on the surface of the water. Therefore, the bottom of any large body of water will tend to remain at 37 degrees F most of the year. The above table outlines the necessary saves and resultant cold damage from being in water at various temperatures. Unlike pressure, Constitution saves against cold damage from water must be made each minute, even after a successful save. The table assumes that the creature is not wearing anything that will provide meaningful insulation while in water. Normal clothing or armor is of no benefit. A creature wearing a watertight outfit that captures a layer of water next to the skin (like a wet suit) has advantage on Constitution checks against the cold damage. Smearing the skin with grease or fat, which repels water, will provide a +5 bonus to the necessary Constitution saves. Of course, magical forms of protection from cold also apply. It’s no secret that pretty much every parent who plays any kind of tabletop game wants their kids to join in on the fun as well. Besides everyone using their imaginations to play, D&D helps to develop your kiddo’s cognitive skills such as reading, problem-solving, and creative thinking. Wizards has released 2 kid friendly D&D adventures: Monster Slayers: The Heroes of Hesiod and Monster Slayers: The Champions of the Elements, both by Susan J. Morris. Parents can use this simplified rule-set as a stepping stone to introduce new players, young and old, to the world of D&D. Once you’ve finished these quick adventures you can move on to bigger campaigns and hopefully have the time of your life introducing the little ones to a game that they could be playing for years to come. You can find what Susan J. Morris has to say about it here and still more information (and a link to the original Monster Slayers adventure) here! This is a complete re-write of the rules I posted in 2012 for version 3.5 (here). In keeping with the feel of 5E, these rules focus on the PCs. D&D Skyships is a supplement to fifth edition Dungeons & Dragons set in a universe of ships that fly between the worlds and of battles in the air and in space. This is a basic set of rules compatible with Dungeons & Dragons 5E that provide a foundation for taking your D&D adventures into space. Rules for conducting a seafaring campaign in D&D. Including rules for Ship-to-Ship Combat. This is a complete re-write of the Ship to Ship Combat rules I published before (3.5 version here). In keeping with the spirit of 5e, this is not about conducting massive sea battles, moving small model ships around on a hex battle map exploring tactics and the intricacies of wind and sail. Rather this is about what the PCs can do with ships. Ship-to-ship battles do take up the majority of the pages here, but the battles are from the point of view of the player characters on board their ship. Care has been taken to assure each payer has something to contribute each round of ship-to-ship combat. Each player controls one of their ship’s officers. That officer can be his or her PC or it may be an NPC and he has several actions available to him that are specific to that officer. I also found a lot of good information in Kenzer and Company’s “Salt and Sea Dogs”. A special thanks to Shawn at http://tribality.com/ for his series on Naval Combat for D&D 5th edition. He got me to thinking seriously about how to keep all of the players involved in naval combat. I haven’t posted here in a while. I have been working on 5E Ship-to-Ship combat rules. They will be finished soon. In the mean time here is part that may be of general interest. Rough water adds 5 to all the following DCs except for saves made when more than 5 feet under the surface. Flotsam or other floating items grant advantage to saves to stay afloat. This can be hazardous to your health. If you fall overboard you will splash down 1d6+5 feet from your ship. If you are pushed overboard you will fall 2d6+5 feet from your ship. If you jump or dive into the water you can enter the water at any point up to the maximum distance you can jump (refer to the Jumping rules in the Player’s Handbook). If you fall or are pushed overboard, you must succeed on a DC 10 Dexterity (Acrobatics) check to enter the water without damage. Otherwise you receive 1d6 hit points damage from the fall. Each foot you swim cost you one extra foot of speed. If you are within 5 feet of a moving ship (or one that has been involved in a ramming or grappling maneuver), you must make as DC 10 Strength (Athletics) check. Failure means that you cannot move this round, you are using all of your strength to simply keep your head above the waves. Once you reach the ship, you must make as DC 15 Strength (Athletics) check to climb back onto the ship. Failure results in you falling back into the water. You can swim underwater as long as you can hold your breath (see “Drowning” below). Your underwater swimming speed is the same as your surface swimming speed. You can swim straight down at half that speed. You can swim straight down at 15 feet per round if holding the equivalent of medium armor, or 25 feet per round if holding the equivalent of heavy armor. If unencumbered, you can swim straight up at 20 feet per round. In general, heavy armor is not terribly common on ships. The weight tends to be the most prohibitive factor – falling overboard in 65-pound full plate normally results in death. Occasionally, combat Infantry will don light or medium armor for a battle, but most of the time sailors go unarmored. A lucky few (usually the PCs and important NPCs) have magic items that improve their AC, but most sailors rely on their natural Dexterity. Attempting to swim while wearing light armor requires that you make a DC 10 Strength (Athletics) saving throw each round. Failure means you have a speed of 0 as you go under water for that round and loose one carried item, shield or weapon (your choice as to what you drop). If you choose to remove your armor after entering the water, it will take one minute (10 rounds). A successful DC 15 Dexterity (Acrobatics) save will cut that time in half. During this time you cannot swim or take any other actions. You make a DC 10 Dexterity (Acrobatics) saving throw each round. Each round that you succeed you keep your head above water and counts as one round of the rounds required to remove your armor. Failure means that you went under water this round and made no headway in removing your armor. After 3 failures you receive one level of exhaustion. You can attempt to swim while wearing medium armor, but you must make DC 15 Strength (Athletics) saving throw each round. On a success, if you are on the surface at the beginning of the round, you stay on the surface. Each foot you swim cost you two extra feet of speed and you can take no other actions besides shouting and stowing a weapon. Failed save means you sink 10 feet and lose any still-carried shields or weapons. On the round following a failed save you are under water. After that, on a successful save you can swim toward the surface at a rate of 15 feet per round. On failure you sink another 10 feet. You can attempt to remove your armor, but you will be sinking at a rate of 10 feet per round during this time. It normally takes 1 minute (10 rounds) to doff your armor, but a successful DC 15 Dexterity (Acrobatics) save will cut that time in half. Without your armor you can swim toward the surface at a rate of 20 feet per round. You cannot swim while wearing heavy armor, giving you an effective speed of 0. Whenever you are in water, you lose any carried shields and weapons and begin to sink. You make a DC 25 Strength (Athletics) saving throw each round. Success keeps your head above water, or if you start the round under water you can swim 15 feet toward the surface. You can take no other actions. Failed save means you sink another 20 feet. You can attempt to remove your armor, but you will be sinking at a rate of 20 feet per round during this time. It normally takes 5 minutes (50 rounds) to doff your armor, but a successful DC 15 Dexterity (Acrobatics) save will cut that time in half. Without your armor you can swim toward the surface at a rate of 20 feet per round. After 1+(con bonus) minutes of holding your breath underwater you fall unconscious, your hit points fall to 0, and you can then survive for a number of rounds equal to your Constitution modifier (minimum 1 round). After that, you begin making your death saving throws as per the standard rules. However, if you become stable there is a problem. If you are still under water you can’t remain stable. So you must start making death saving throws again. This continues until you die unless you are saved in some way. Rules for conducting massive battles in D&D. This is a complete re-write of the rules I published before (3.5 version here) (Next version here). In keeping with the spirit of 5e, these are simpler and play faster than any of my previous attempts. D&D Wars is a supplement to fifth edition Dungeons & Dragons that provides a set of mass combat rules for conducting battles with units as small as one to armies numbering in the thousands. D&D Wars are not simply armies making battle with each other. It is armies intermixed with monsters and NPCs. Added to this mix is a group of PC heroes doing what they can to change the tide of the war. 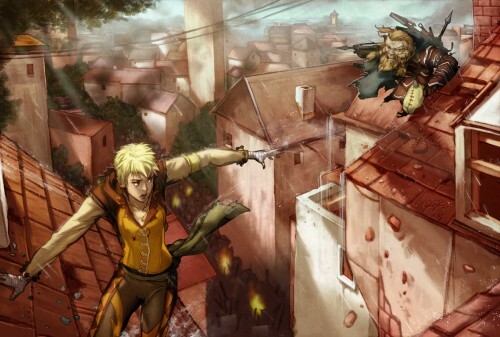 – The rules are compatible with Dungeons and Dragons version 5E. – There are rules for creating armies comprised of units of various sizes and compositions. – It has consistent rules for scaling the battle from a small group of villagers with torches and pitchforks all the way up to epic battles with thousands of soldiers on both sides. – The rules accommodate individual monsters wandering across the battlefield as well as other NPCs and PCs that are not part of the units. – It uses standard combat rules without modification as far as possible. 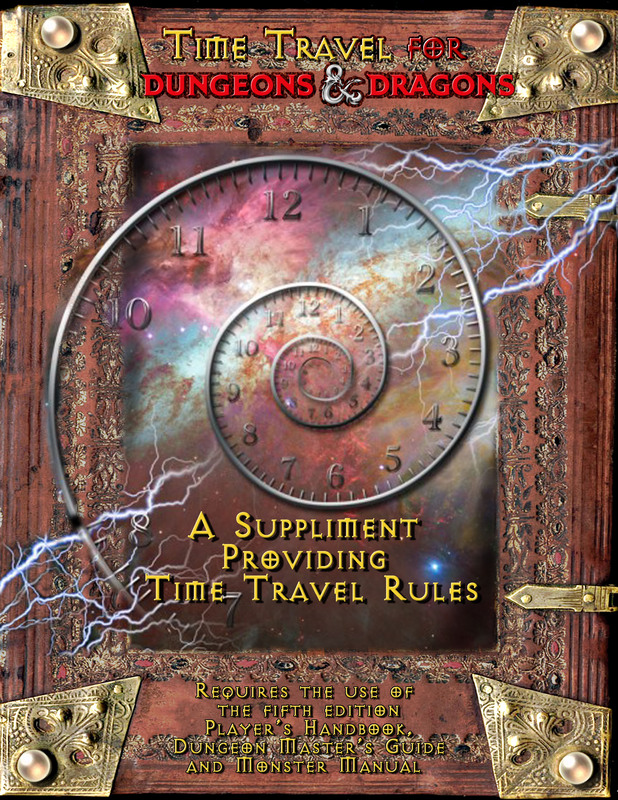 I finally updated my Time Travel rules for 5E. They aren’t much different than the rules I made for D&D Next (here), but I have expanded them and added a section with ideas on how to incorporate these rules into a Time Travel Campaign. I also added a Forgotten Realms timeline to which I added some Pre and Post history for use in a time travel campaign. A couple of years ago I published chase rules for D&D v3.5. You can download them here. With the release of the fifth edition of Dungeons and Dragons, those rules seem rather heavy. You can still use them if your campaign will have a lot of chases. However, in keeping with the slimmed down rules of 5e, I am proposing a simple house rule for chases. The description below is in terms of a PC character chasing a fleeing foe. Keep in mind that the same rules apply when the PC is the one fleeing. What if your opponent tries to run away? Most of the time the standard rules for combat work just fine. A chase may occur when one or more opponent turns and runs away. In game terms, he uses the Dash action to spend his entire turn moving away from combat as quickly as possible. If he starts his turn within 5 feet of you, or passes within 5 feet of you, you can use your Reaction to make an opportunity attack. What if you want to chase him? It all depends on how far away you are from him at the beginning of your turn. Compare this distance to your characters speed. There are three possible results. 1) You can use your Move to get within 5 feet of him. You can attack him and combat continues. 2) You can catch up to him by using your Dash action. You stop within 5 feet of him. Or he may choose to turn and fight on his turn. 3) You cannot get to within 5 feet of him using your Dash action. If your speed is greater than his, you should catch up with him in a few rounds. If your speed is less than his, and you have no way to increase your speed, he will get farther away each round. You may as well attempt to shoot him with ranged weapons until he is out of range. If your speed is the same as his, he will stay the same distance away from you forever. You move closer on your turn, he moves away on his. This is where a house rule is needed. At the end of a turn where you have used a Dash action to advance toward an opponent that is fleeing, you may call for a Strength (Athletics) contest between the two characters. If you win the contest, you move an additional 5 feet toward your opponent. If you lose the contest, you move back 5 feet. After 5 rounds of continuous running, a character must make a [DC 15] Constitution save or suffer one level of exhaustion. Each additional round of continuous running requires another save at an additional +2 to the DC. The DM may rule that certain creatures are immune to this exhaustion effect, or that they can run for longer periods before requiring this check.